FATHERS and SONS, is he distant and you constantly treading on eggs? FATHERS and SONS asks if Papa is distant and you are constantly having to tread on eggs? Or, is it the other way round? This page was last updated by Bernard Preston on 16th December, 2018. In his auto biographical book When a Crocodile Eats The Sun, Peter Godwin talks about his relationship with his typical fairly good, but distant father, going on to describe how he, Peter, senses that he was rather an embarrassment to his father. More about this book at a later stage. Strangely enough, just today a friend described the relationship with his daughter, saying that his daughter embarrassed him. It got me thinking. I have had that feeling as well. My father was, initially, and till very late in his life, also rather embarrassed by me. My father came from a very sporty family. He played first team rugby for his school and my cousin even played cricket for the then Southern Rhodesia. I played nothing. Well, the piano didn’t count. Not only was I convinced that I had no natural sporting ability, (as were the sports masters at my school) but I had no desire to acquire any of those skills. But I was VERY passionate about music and played the piano with above average ability. But, for my father, it wasn’t rugby. Dad never said anything except once when he let slip and told a person who asked me for the cricket score: “Don’t waste your time. Mike wouldn’t know which end of a bat to hold.” While I think there was a measure of pride in my musical ability, again my father never verbalized a thing. So I proceeded to make my way in life, relatively successfully I think, on my own. But there was huge void between my father and me, two men who should have the closest of personal bonds. This became even more real when, in their declining years, my father and mother came to live with us. Often in the late afternoon when I came in from the conference centre I ran, my mother would say to me – “Son, go and talk to your father”. I always went and sat with Dad, but, yes, we would have little to talk about except the most emotionally distant and safe things. Sometimes I would play pieces that I knew he liked on the piano, desperately hoping for a response. There never was one. Finally two days before Dad died, then living in a frail care centre, he called me to his bedside. For about two hours we talked and talked, heart to heart for the first time. I wept. For the first time ever he told me I was a “good boy”. I was 59; and that he loved me and was very proud of me. My weeping was not a response to his affirmation of me, but because of the deep sadness that he had only been able to verbalise these words on his deathbed. What would our relationship have been like had he said those words to me half a century ago? I never knew how he felt. He had never been able to tell me. Even so, I treasure those two hours. I had often thought about the sad and, to both my father and me, unsatisfying relationship, and remember saying to my wife that I suppose Dad related to me in the same kind of way as his father related to him. I made the decision that when we had children, relationships would be vital and I would respond to my children in a quite different way. Little did I know the cost this would have for me personally! But also the incredible fulfilment and joy it has brought. Marion arrived, virtually holding a paintbrush, loving art and music. It was so easy to connect with her. But then Gareth, yes, with all the sporting genes that passed me by! He was into any and every sport around and excelled at rugby especially. So I committed myself to watching every single rugby match that Gareth played in. I became involved in his world and his interests. I consciously looked ahead to my declining years and the kind of times I would like my son and I to spend together. Has it worked? Well I am not in my declining years yet! but we have the kind of relationship I am really proud of. He even asked me to his bachelor party! When I protested that surely he did not want someone like me around then, he simply insisted. I realised then that he is as proud of me as I am of him. Our relationship is strong and most enjoyable to us both. I am not writing this to boast or to boost myself, but I believe it tells some important things about what I am as a person, rather than who I am – my job title and job description will answer that. I also write because, in my career working with young people, I have met so many children who have similar father/son or daughter relationships to the one I had with my father. I am convinced that it does not have to be like that and now, too late, I regret that I did not try to help my father find the emotional freedom I am sure he longed for. Are you one of the many men and women out there who need to find this freedom? I hope I can encourage you, should you have experienced a parental relationship which has been less than you would have liked, make and implement decisions which will lead to the wonderful closeness and intimacy which parent/child relationships can and should bring. I will be saying more about this next week. If anything here strikes a note with you, then consider acquiring a copy of Steve Biddulph's excellent book for men. 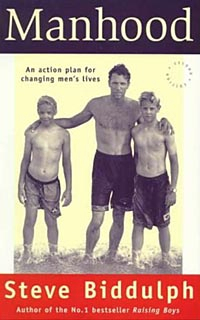 "Manhood" (Published by Vermilion) has a very helpful chapter on the importance of the father/son relationship. I recommend it strongly. Fathers and sons can profitably go hiking together, but sometimes pain in upper leg can stop you in your tracks. And not only dad. Go from FATHERS AND SONS to Bernard Preston HOMEPAGE. The Great Emergence by Phyllis Tickle. All about the puzzling changes within the Church Universal. Has it ever been different in the Church?